I’ve developed a new appreciation for self-rising flour. It makes biscuits and muffins a little softer, and skipping the step of adding baking powder and salt to the flour is a plus. I don’t plan on using it in everything, but I like finding new recipes that benefit from self-rising flour and I think this is one of them. These were quick to prepare, had just the right amount of chocolate, domed nicely, and were dense and heavy enough so as not to be confused with chocolate cupcakes. With just 1/4 cup of sugar they weren’t very sweet, but the added 1/2 cup chocolate chips balanced things out. Still, I recommend using a “generous” ¼ cup of sugar, unless you are really keen on not-too-sweet muffins, in which case you should stick with the ¼ cup. The evaporated milk was another interesting ingredient and one I’d never used in muffins. I think it might have contributed to the muffin’s texture by adding extra dairy and less moisture. Either way, I’d use it again. This recipe is going to be a mainstay, but I plan on increasing the sugar just a tad. Mix flour, cocoa and sugar in a mixing bowl. Whisk butter, egg, evaporated milk and vanilla in a separate bowl. Add milk mixture to flour mixture and stir until just combined. Fold in chocolate chips. Spoon the mixture evenly into prepared muffin cups. Put muffins in the oven on center rack. **These muffins aren’t extremely sweet, so they really do need the chocolate chips UPDATE: I tested these again and added 2 tablespoons of brown sugar. With the extra 2 tablespoons, the muffins were sweet -- not overly so, but more dessert-like. If you know you like sweet muffins, you may want to add the extra brown sugar. I wouldn't add over 2 T.
I doubled this recipe last night. These are really good! I nearly doubled the sugar, which is why I think mine weren’t as pretty as yours, the tops spread a bit more, but they taste very yummy! Sue, I tested with an extra 2 tablespoons of brown sugar. It definitely added sweetness, but I can’t decide if I like the sweeter version better than the less-sweet version. This recipe is definitely going on the to try list! I love the double chocolate muffins with the pumpkin that you wrote about in the past. I actually prefer them to brownies and cake! 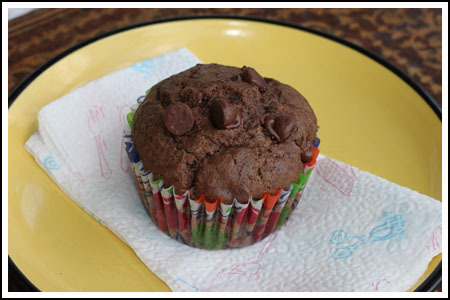 I never dreamed I would like chocolate muffins so much so these have real interest to me. I used to use the baking powder/salt/all purpose substitute and I still do in a pinch, but I think the flour they use for self-rising (or at least the brand I buy) might be made with a softer wheat. I’m going to have to research that, but I think I get better results for certain things (not cookies) when I use it. Six muffins is the perfect amount for us as well. Lisa, I can’t wait to hear how they turn out! I guess self-rising flour is the norm where you are, right? I will DEFINITELY be making these, and adding more sugar. I will also have to use a SR flour substitute, which loses me the quicker mixing up, but I don’t mind adding a couple of extra ingredients. 🙂 So far my favorite double chocolate muffins are the yogurt ones you posted long ago, and I make them regularly. I’ll comment on here when I try these. Thanks for the recipe! Yum! and six muffins – just the right amount. Thanks. The use of evaporated milk is interesting. These sure look good – definitely worth a try. We use SR flour a lot in Australian recipes; it was only when I started TWD that I reversed my use ratio to plain flour and baking powder. Cindy, I think the fat free evaporated milk would be fine. These were really good! Like I said above, my only advice is to use a slightly generous measure of sugar and not to skimp on the chocolate. I’m guessing since the recipe includes butter/baking sticks that one could use fat free evaporated milk. Putting these on my “try in cooler weather” list!